Parmesan Chicken Drumsticks with Garlic Butter – A gluten-free, oven-baked chicken that’s better than fried! It’s low carb and keto friendly too! If you can have bread, try dipping it in the delicious garlic butter! 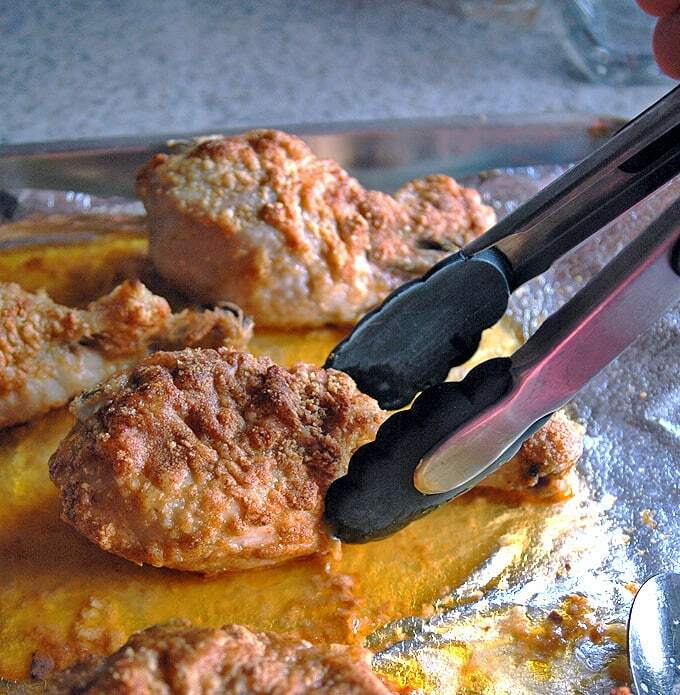 I’d be remiss if I didn’t share this recipe for Parmesan Chicken Drumsticks with Garlic Butter. It’s the most kid-pleasing, man-pleasing and mom-pleasing chicken I make on a regular basis. 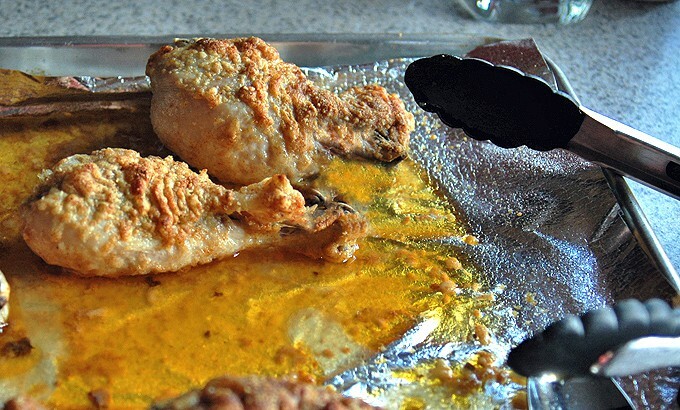 The drumsticks are baked on a foil-lined, rimmed sheet pan for an hour. And then…Then they will emerge from the oven, a bit crispy on the outside, tender and juicy on the inside, and resting in a pool of mouth-watering garlic butter that we love to soak up with fresh, Italian-sliced bread. Bits of crispy Parmesan dotting the pan provide the perfect salty accent. To say I serve this “family style” would be too refined. Maybe “Flintstones style” is more appropriate. We start out very civilized, with a drumstick or two on our plates, and forks and knives that are optional. Meanwhile, the baking pan is at one end of the table, beckoning to us with its garlic butter goodness. Each of us eats with one eyeball monitoring (or guarding) the pan. You don’t want to be the last one to get to The Pan. Then, it’s time to grab a slice of bread, reach over rudely and dip into The Pan. This is immediately followed by protests. Then, anyone sitting too far away must get up and walk around the table, carrying bread slices, to elbow in and get a spot at the trough — I mean The Pan. It’s important to dip as fast as you can while keeping your eyes peeled for competition. Eventually, someone, preferably a responsible adult, must referee the process to ensure that everyone has gotten a decent amount of garlic butter action. And here’s my secret: this is one pan you should volunteer to wash. When you lift up the foil, more goodness awaits. In case anyone is wondering, I did make this once with chicken breasts, for a dinner party. They tasted good. P.S. If you like this recipe, you’ve got to try my Lemon Parmesan Cod with Garlic Butter! Even people who don’t like fish love it! 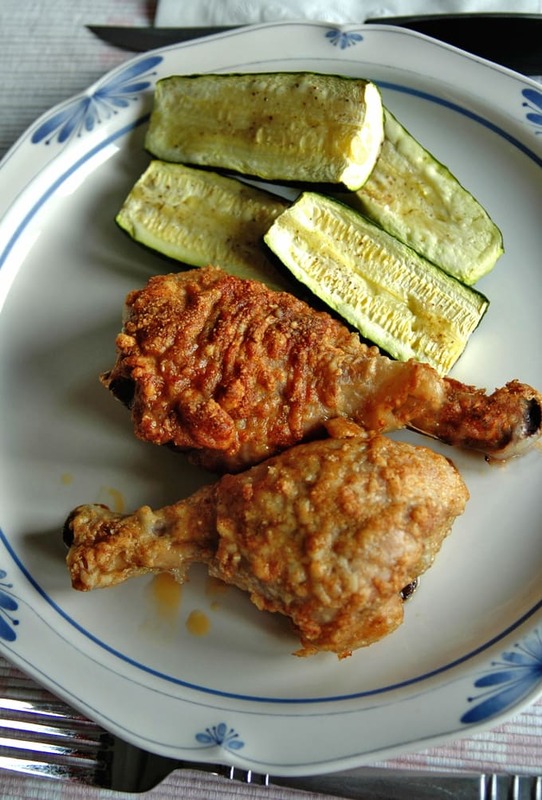 A delicious oven-baked, gluten-free alternative to fried chicken, with an Italian twist. Great with bread to dip into the melted garlic butter (or serve with rice to keep it gluten-free). Preheat oven to 350 degrees. Line a rimmed baking sheet with foil and grease it with cooking spray. Remove skin from each drumstick by using a paper towel to grasp the skin and pull it off. Rinse chicken in cold water and pat dry with a paper towel. Melt butter in a pan on the stove or in the microwave in a microwave-safe bowl. Grate Parmesan (use a Vitamix or food processor if you have one.) Place grated cheese on a dinner plate and mix in paprika and garlic powder. Set up an assembly line from left to right, with the chicken, the pan of melted butter, the plate with the seasoned Parmesan and the foil-lined pan. Use a fork to spear a drumstick, dip it in butter, then into the Parmesan mixture, coating all sides. Place the coated chicken on the foil-lined pan. Repeat for the rest of the chicken. Bake the chicken uncovered for one hour, or until completely cooked. Check for doneness by cutting into a piece. It should no longer be pink inside. Serve the chicken with sliced Italian bread to dip into the melted garlic butter from the pan (or to keep it gluten-free, serve with rice). When you used chicken breasts how long did you cook for and at what temperature? Thanks! Coll, if you use thick chicken breasts that are 6-8 ounces each, you can bake them at 375 degrees F for 25 minutes, then let them rest for a few minutes before serving. Enjoy! You have me drooling over here, Liz! Thanks for letting me know you enjoyed this. Since we are on the subject of uncivilized would grated parmesan cheese out of the bottle be okay? Decided on this recipe last minute. Haha! I think it would work for a last-minute situation. When you have more time, Bekah, the fresh cheese will have a better texture. Thanks for the opportunity, Karly! Made this tonight and you were not exaggerating the pan dripping scenario!!! It was amazing…even Emily loved it and she’s not a big chicken fan!! New staple for our family…keep ’em coming!! I’m glad we’re not the only ones who can’t behave with this! Thanks for letting me know you enjoyed it. 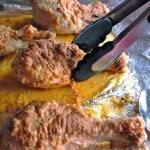 Will definitely try this…always need new ways with chicken and the kids favor drumsticks!! Joann, you made my day. All I know is that this is what I’m supposed to be doing, and I’ll see where it takes me. 🙂 Thanks so much.